Hot Metal Spraying or Thermal Spraying has been used for over 90 years. Molten metal is sprayed on to a pre-roughened substrate and on contact the particles spread and bond with each other. This forms a very durable covering which will protect a wide range of products, especially when they are exposed to hostile environments. Surprisingly the substrate is not affected by heat distortion as the molten particles only transfer a small amount of heat to the surface being sprayed (typically less than 100°C). This is a major benefit, especially compared to hot dipped galvanizing. 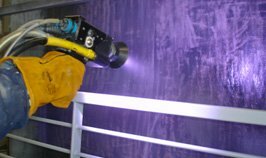 Thermal Spraying also provides a uniform surface for subsequent coatings to adhere to, thus eliminating the need for time consuming fettling of runs and sharp edges. We have invested in one of the largest workshops in the South East, with over 14,000 square feet of flexible space. Our highly trained staff are able to undertake all types of project delivering a professional, quality service that is underwritten by our ISO 9001 Quality Management system ensuring we have standard procedures in place to guarantee quality and consistency of our product. To enquire about our Hot Zinc spraying service, in London, Essex and Kent please call 020 8311 4448 for more information.